Rise & Shine Carnival + Giveaway! A few weeks back, I shared the importance of having breakfast because quite simply - research has shown that children who eat breakfast daily are associated with greater alertness, greater tone, reduced anxiety... and they perform better on tests of creativity and mathematics too! 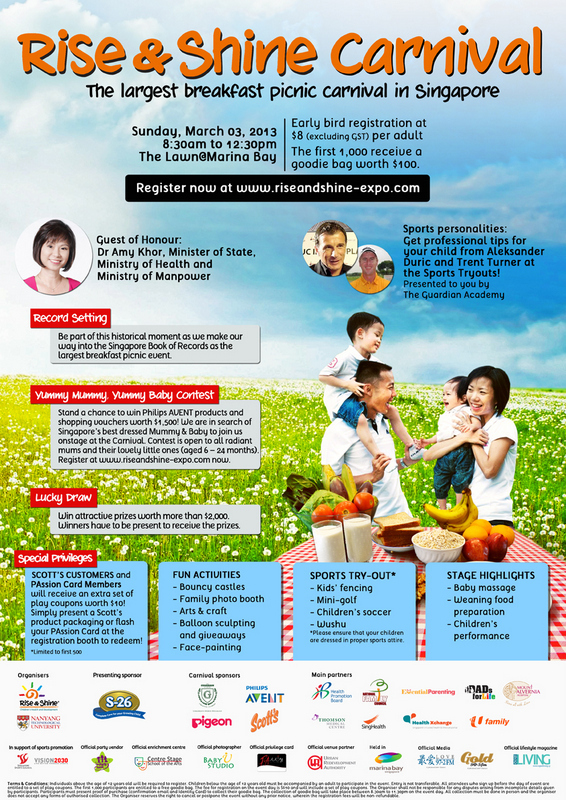 So what better way to promote healthy breakfast eating on a daily basis among children than to organise Singapore's largest breakfast fiesta on 3 March 2013! The Rise & Shine Carnival 2013 is one huge breakfast picnic at The Lawn@Marina Bay, where kids would be kept busy with a line-up of gigantic bouncy castles, sports try-outs, engaging crafts including balloon sculpting, face-painting and stage performances. For a glimpse of activities that you and your family can partake in, kindly click HERE. Registration fee is $8 per adult with free admission for children aged 12 and below. Every paid participant will receive a set of play coupons worth $10. But hurry! If you are the first 1,000 to sign up, you get a Goodie Bag worth $100 too! Click HERE to sign up.